Chevrolet has a long and storied history of offering (Duramax) diesel engines in its trucks, but not so much in cars. To the surprise of many, the latter has changed in recent years, and the bow tie brand has become a leader in diesel-powered passenger vehicles, as well as trucks. The brand’s modern diesel car push started with the first-generation Cruze – which began offering the 2.0L Turbo-Diesel LUZ engine making a whopping 280 pound-feet of maximum torque starting for the 2014 model year. It was followed by the 1.6L Turbo-Diesel LH7 engine in the second-gen Cruze Diesel and third-gen Equinox Diesel. And now, it looks like another Chevy passenger car – the Malibu midsize sedan – will join the diesel party. 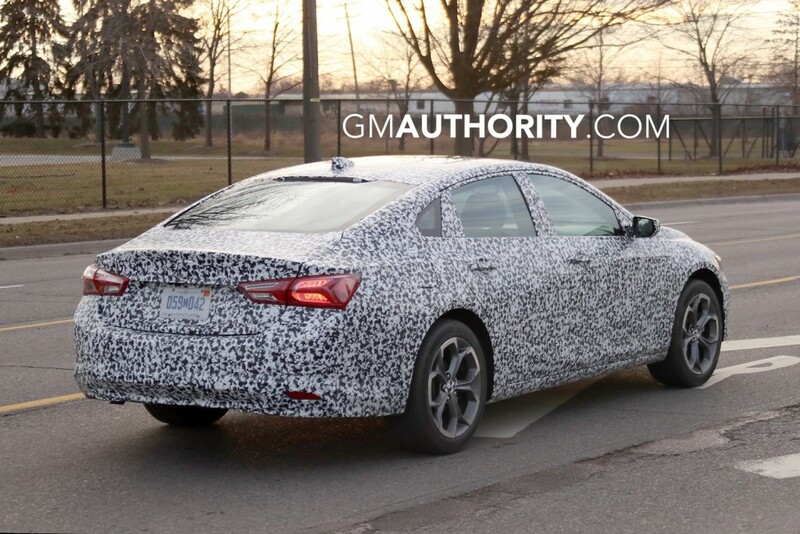 That comes by way of our spy photographers, who believe to have heard a diesel engine under the hood of the camouflaged 2019 Malibu development prototype. Assuming that the 2019 Malibu will introduce a diesel engine option, the logical engine choice would be the aforementioned 1.6 liter turbo-diesel LH7 that is offered in the 2018 Chevy Cruze, 2018 Chevy Equinox Diesel, as well as on the 2018 GMC Terrain Diesel. In those vehicles, the motor makes 137 horsepower (102 kW) at 3750 RPM and 240 pound-feet (324 Nm) of torque, and helps the Cruze deliver an impressive 31 MPG city, 47 MPG highway and 37 MPG combined, which is quite a bit more than the 30 MPG city and 42 MPG highway – the highest fuel economy figures achieved by the gasoline-powered Cruze, at least until the arrival of the rumored Cruze Eco. Though we don’t imagine the take rate for a Malibu diesel will be high, offering the engine as an option appears to be strategic for Chevrolet as it works to attract owners of diesel-powered Volkswagen vehicles disgruntled by the German automaker’s cheating of diesel emissions testing. Having driven several vehicles with the 1.6L LH7, we have to note that it’s an outstanding motor. In fact, its quietness and refinement characteristics earned it the “Whisper Diesel” moniker from GM’s ex-European arm, Opel, which was tasked with developing the motor. Introducing a diesel engine option would equip the current, eighth-generation Malibu family with two fuel-efficient models, with the other being the Malibu Hybrid – which achieves 48 MPG city and 45 MPG highway and makes 136 horsepower and 277 pound-feet of torque of total system power. We expect to see the Malibu Diesel information to show up alongside 2019 Chevy Malibu refresh, which should be unveiled at an auto show in the coming months – so be sure to stay tuned to GM Authority for more coverage. In the meantime, check out the most recent set of 2019 Malibu spy shots. Good to hear. The more variants, the faster they can establish their own niche in the marketplace beyond where the usual suspects compete. That will be very important as sedan offerings from the competition dwindles as crossovers become more popular. Chevrolet must still offer a competitive mid sized sedan in many countries either way. They have a very good product with an excellent hybrid that matches or bests the Camry very well. A diesel model isn’t going to double the cars sales, but it will bring new buyers that otherwise wouldn’t consider a Chevrolet – particularly VW buyers. They also need to seriously consider an all wheel drive model, an RS model, and a station wagon version to go after Mazda and Subaru. The spy photos look very promising. I’m glad they are trying to keep their mid sized car fresh. Hopefully it includes a very attractive front end and top shelf lighting and interior materials. Chevrolet should consider introducing the 1.6L Turbo-Diesel LH7 engine in as many vehicles in their lineup as possible especially as the turbo-diesel because of it’s 240 lb-ft of torque can give a higher level of performance than the current gas powered engines. Who cares? There is demand for it. Let them satisfy this demand. Also, it will take a lot longer than 5-10 years for diesel fuels to be no more. Not when cities ban them. My wife currently owns a 2014 Cruze Diesel, and it’s been an excellent vehicle. The fuel economy is absolutely outstanding, and with the LUZ, it is torquier than hell (the rating of 280 lb-ft during overboost might be a but understated…the car made almost 260 lb-ft at the wheels on a dyno, bone stock). We’ve been looking at potentially upgrading to a Cruze Hatch Diesel in the future (moreso my wife, I see no reason to buy a new vehicle when hers is fine), but to be perfectly honest, if they offered the Malibu with one, we would probably move up to that, if for one specific feature: memory seats. It’s good to offer the Malibu with a diesel engine, but why just a 1.6? Why not the 2.0 engine than powers the Insigna? Or why not the upcoming 3.0 Duramax, that could be awsome. the 3.0 can also powers the Colorado in place of the 2.8 , the Impala and Chevrolet SUV. The 1.6l and 2.0 diesels are not Duramax branded. A transverse mounted inline six, such as the 3.0L Duramax, is incredibly rare. The engine is generally too long to fit sideways between the wheel wells and the transaxle. 2.0L would be an interesting option. I think that was the size of the Passat TDI diesel, right? Either way, that 1.6L is supposed to be an excellent motor. The 1.6 and 2.0 are Opel engines. It may be good idea to replace the 1.5 liter current standard engine with the 2.5 liter naturally aspirated engine. it will give the customer more choices to pick from. Not everybody likes turbo engines. Ford also offers turbos AND naturally aspirated engines to choose from.